Many marketers are still using data like a “drunk uses a lamp post for support”, when they should instead be looking to innovate their business model. 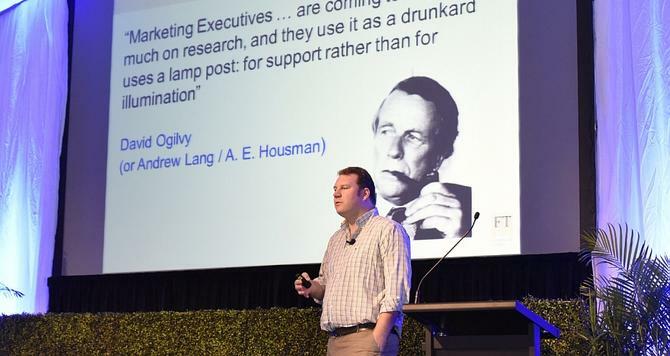 Borrowing a quote from David Ogilvy describing marketing’s reliance on research, the Financial Times’ (FT) head of analytics, Robin Goad, said many organisations are still using data analytics largely for mundane tasks, such as backing up a decision or reporting on historic patterns of behaviour. “We need to use data for illumination, rather than just reporting or supporting decisions made at a senior level,” he told attendees at this year’s Data Strategy Symposium in the Hunter Valley. Goad detailed how the UK-based media publisher is using data insights gleaned from its 690,000 total paid subscribers, including 476,000 digital subscribers, to come up with new products, inform editorial staff on the types of content succeeding with its audiences, and drive customer awareness across the organisation. One of the big challenges he identified was integrating customer insights across the plethora of devices now at their disposal. He claimed the concept of a unique user online is “defunct”, and urged marketers to look at customer engagement as an integrated approach. FT has an upper hand in that readers must login to read more than eight pieces of content per month, regardless of device. This subscription information provides the publisher with a wealth of data on reader behaviour and access. An example of how FT is utilising data is in understanding changing reader habits. Goad noted certain spikes during the day and week in content access, one of which is driven by early morning commuters. As a result, FT has launched a new email service, ‘first FT’, which is distributed at 6am and has triggered further spikes in readership. The publisher also now publishes a lot of its “weekend” content, including arts, culture and interview articles, on a Friday afternoon after seeing a rise in consumption of such content after Friday midday, Goad said. In the last few months, it has launched a ‘weekend early’ subscription product to address the needs of that audience at a lower price point. FT has also used data and propensity modelling to get those on the cusp of signing up to a paid subscription to its media site over the line faster. To support its data-driven agenda, FT has built a centralised team of 20 people led by two data scientists with experience in building propensity models. They are supported by big data resources who are “good at getting rid of noise and spotting trends through data”, Goad said. There are also data intelligence staff performing day-to-day projects as well as working on strategy. “Key to those commercial analysts is the skills – they don’t have to be experts in maths, they need to have the right technical skills and right understanding of business, but key is communication and stakeholder management,” Goad said. Underneath this, FT has moved its reporting team offshore, a reflection of the lower strategic focus this function has in the overall data analytics picture. The analytics team works closely with customer research and campaign management functions to deliver insights into the business. Next on Goad’s priority list is to a better understand the quality of an article based on customer interaction. In addition, he’s looking at premium advertising models that reflect the stronger reader engagement with deep-dive content. Another area of improvement is empowering the business better through data by putting more of it in end users’ hands. Continuous improvement remains a core focus, and Goad admitted there is always going to be the business-as-usual work to be done by the analytics team. “But for the amount of time you have left, try and carve out time to build out stuff that is innovating, empowering your stakeholders or improving the reporting you do in that business,” he advised. Nadia Cameron travelled to the Data Strategy Symposium as a guest of Ashton Media.